The cultural phenomenon known as the Swinging ‘60s was a youth-driven cultural revolution that took place primarily in London during the mid-to-late 1960s. After decades of culture being centered around family values and social hierarchies, this incredibly progressive time saw a flourishing of art, music, and fashion centered around the lives of young people. Most of the culture in London was symbolized by the city's "pop and fashion exports”: The British Invasion, Mary Quant's miniskirt, popular fashion models like as Twiggy and Jean Shrimpton, the mod subculture, and the iconic status of popular city areas (Carnaby Street, Mayfair, Chelsea, King's Road, and Kensington), the popularization of psychedelic drugs, and sexual liberation. Music, of course, was both one of the biggest influencers and influences of this time, with "the London sound" comprising of - most notably - the Who, the Kinks, The Beatles, and the Rolling Stones. It was a heady, crazy, ridiculously creative time for bands and artists, and though the scene moved fast, the music - like the miniskirt - was here to stay, and lasted long after Swinging London shaved their heads for punk city and then puffed out its sleeves for the New Romantics. 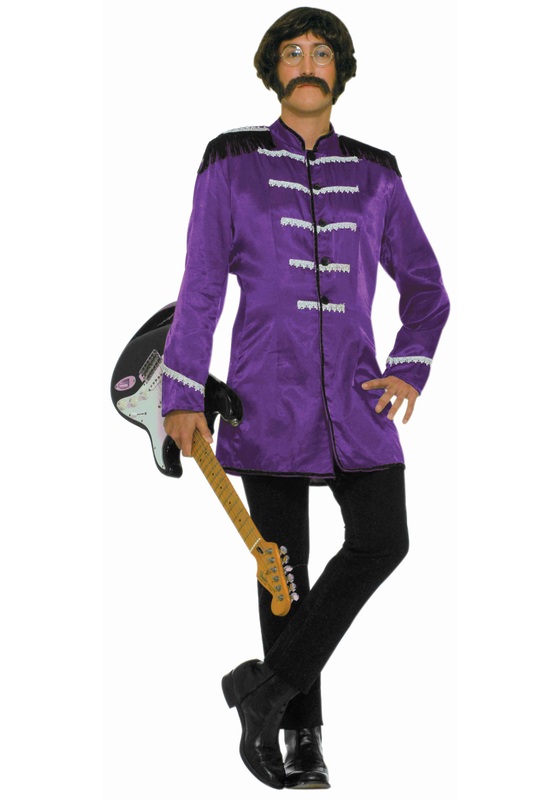 And now, with this Adult Purple British Explosion Costume, you can take a memory (acid) trip back to the Swinging ‘60s and this ultra groovy time! You'll look like you're in the vanguard of the British Invasion with this purple thigh-length frock coat - whose front, sleeve cuffs, and epaulets are trimmed with metallic silver braid, to give it that extra far-out touch - made from 100% polyester satin fabric. The coat also comes in other colors, too, so you can gather a few musically-inclined friends for a one-night-only reunion of the old band! The look was great, but the one size fits some did it in. Managed to split the seams while wearing.